Members of the Gallipolis Shrine Club Guy Guinther and Jack Richards are pictured with Meigs County Library employees Cynthia Hedrick and Makenna McGrath. Members of the Gallipolis Shrine Club Guy Guinther and Jack Richards are pictured with Carleton School students Grace Burden and Sara Richards. 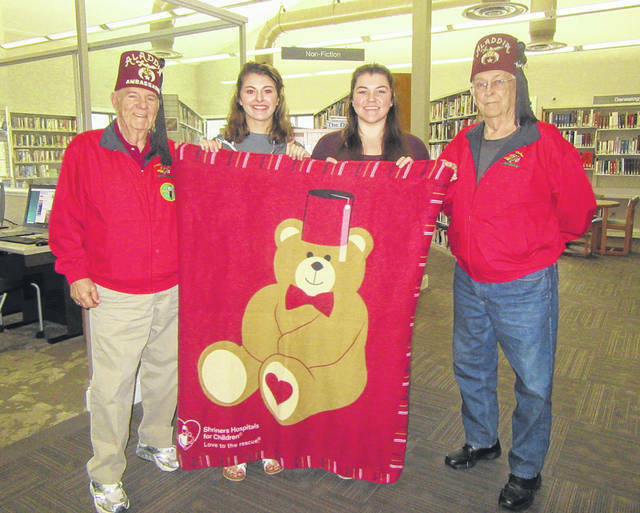 MEIGS COUNTY — Members of the Gallipolis Shrine Club recently delivered blankets and informational material to the Pomeroy Branch of the Meigs County Library and Carleton School. 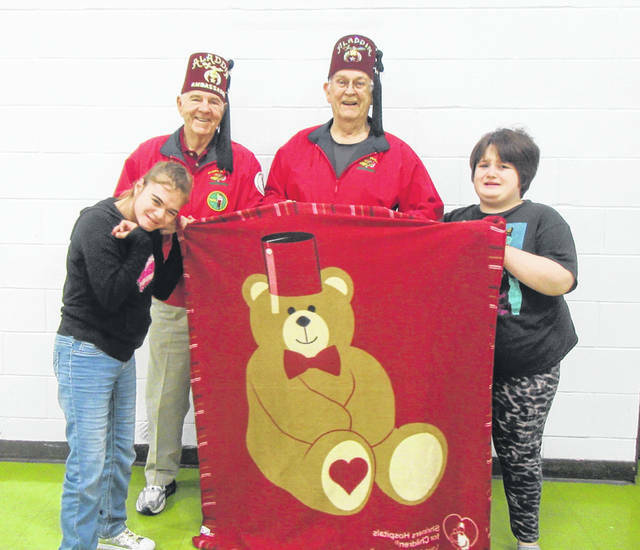 The blankets and information are a way to spread awareness of what the Shriners do and the services that they can provide to area children and their families explained Guy Guinther of the Gallipolis Shrine Club. The local Shrine Club, along with clubs around the country, work to provide children with access to healthcare which they may not otherwise receive. This includes providing kids with orthopedic, spinal cord, cleft lip and palate and burns with the best available healthcare. This access to care includes transportation for the child and parent to the Shriner’s Hospital in either Cincinnati or Lexington where care is provided at no cost to the patient. Guinther explained that if the child has insurance then that will be used as well, but that the family would have no out of pocket expense for care. The Gallipolis Shrine Club can be contacted at 740-446-9150 or find them on Facebook on the Gallipolis Shrine Club page. https://www.mydailytribune.com/wp-content/uploads/sites/42/2018/11/web1_11.13-Shriners-1_ne2018111013112272.jpgMembers of the Gallipolis Shrine Club Guy Guinther and Jack Richards are pictured with Meigs County Library employees Cynthia Hedrick and Makenna McGrath. https://www.mydailytribune.com/wp-content/uploads/sites/42/2018/11/web1_11.13-Shriners-2_ne2018111013116714.jpgMembers of the Gallipolis Shrine Club Guy Guinther and Jack Richards are pictured with Carleton School students Grace Burden and Sara Richards.